Get a break in your busy schedule to check your car brakes @ Luna Service Center. 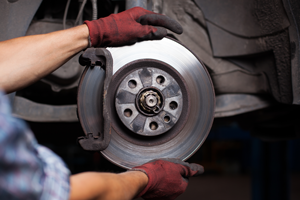 Unfortunately, there is no clear-cut schedule that tells you when it’s time to replace the brakes, so you need to rely on your ears and the advice of an experienced automotive technician. Most vehicles should have their tires rotated at least every six months, and that is a good time to have the brakes inspected, as well. A mechanic can check the thickness of the pads and the condition of the brake hardware to spot wear.